Our first guest post. Submitted by Lee Johnson, Superior National Forest Archaeologist. On July 9-13, 2012, six University of Minnesota Duluth (UMD) field school students, UMD instructor Sue Mulholland, and Lee Johnson and Andrew Kurth of the Superior National Forest Heritage Program, conducted walkover survey of high-probability locations along the Isabella River and Island River, Boundary Waters Canoe Area Wilderness, in central Lake County, Minnesota. 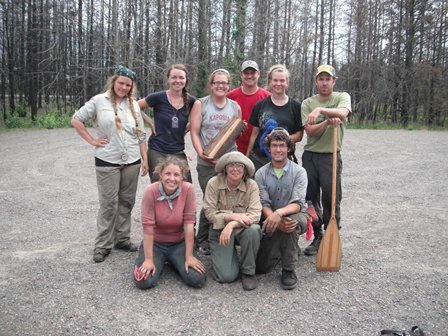 The 5 day field study comprised one week of the 6 week UMD Archaeological Field School, of which the Superior National Forest and University of Minnesota Duluth have partnered on for the last 25 years. 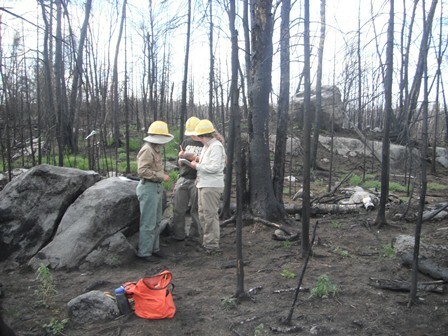 The study area was recently burned over in the fall 2011 Pagami Creek wildfire. Surface visibility throughout the study area was on the order of 80-100%; providing a unique opportunity to inventory new sites while instructing the field school students on pedestrian survey methods, field recordation with Geo XT GPS units, and sketch mapping. The students also joined rock art researcher Bob Evans, of Oklahoma City, Oklahoma, during a visit to the Island River pictograph site. Mr. Evans provided an on-site lecture (in a relatively mosquito free location) regarding the cultural context of the Quetico-Superior pictograph sites and the techniques he developed for post-processing digital images of faded pictographs. The initial focus of the field project was to identify new precontact sites in an area with dense stands of wild rice and a known potential for Terminal Woodland occupations. 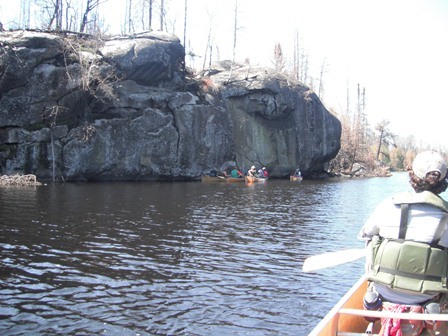 However, the group also identified multiple aceramic lithic scatters comprised entirely of Knife Lake Siltstone on elevated terraces and relic beach-bench features . The Marley Elanor site was found on what appears to be a relic lakeshore approximately 30m from the current shoreline of Rice Lake. 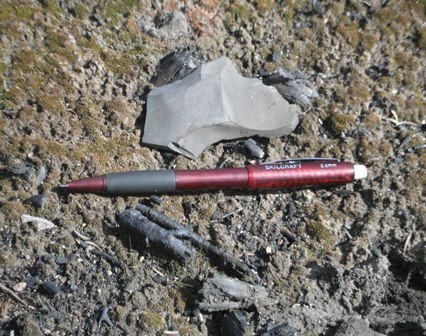 The site consists of large quantities of primary reduction and bifacial thinning flakes of Knife Lake Siltstone (KLS), KLS blades, utilized and retouched flake tools of KLS, gunflint formation bifacial trimming flakes, a Vermillion formation biface, a KLS biface, and what has been provisionally typed as a KLS Plano point preform. The lithic assemblage observed on the surface of the Marley Elenor site is estimated at 400-500 artifacts. Based on root throws within the site area, the site appears to extend between .25-.75 meters below the surface. In total, the survey team documented approximately 15 new sites within the study area. These sites included one historic, 2 Terminal Woodland habitations (Blackduck and Sandy Lake), and 12 lithic scatters. The resulting data will facilitate the Forest’s management of cultural resources over the long-term, while also providing critical data for measuring the direct and indirect effects that wildfires pose to cultural resources in Northeastern Minnesota. It never ceases to amaze me how many sites are in the North Woods. Field schools could spend every summer surveying for the next 300 years and continue finding sites just as these students did. Thanks for this update Lee! MN Field Notes is my archaeological looking glass these days, and continuing to make public updates like this is important to maintaining the connection between the public and our state’s cultural resources. Admittedly, it’s a bit sad to see the scorched trees and barren land. Did much of the persistent old growth survive? @Kelly: yes, it was a great trip. Glad you enjoyed the update. To answer your question, yes, a lot of natural regenerated forest was burned. The burn perimeter was around 110k acres. Some areas were nuked out, and some were burned at a low-moderate severity. I would say, overall, the burn could be considered a “mosiac” type that the fire ecologists often state is natural for the sub-boreal. There were some stands of 200-300 year old white pine near Quadga Lake that torched out. Other than that, I have not observed any other “old growth” stands affected by the fire. A big portion of the burn area within the Wilderness (including the area we surveyed) was actually logged by the Kimberly Clark timber company (out of Forest Center, Mn) from 1948-1963..
Are you still interested in logging camp locations as we discussed last year? If not then I’ll contact the Hubachek group so that what locations I can remember aren’t lost to time.